Good question, but I have to ask you one; gas or steam? No, that's not what my Dental Hygienist asks me before she sets to work cleaning my gnashers. You see Gottlieb Daimler invented the first gas powered motorcycle in 1885, when an engine created by Nicolaus August Otto was attached to a wooden bicycle. Just to clarify things here; 'gas' is not a reference to gasoline, but fuel in a gaseous state rather than liquefied. As two extra wheels were used on this bike as stabilizers, the more pedantic amongst you will disqualify this vehicle as being a four-wheeler, but let's be fair; he didn't have a lot to go on did he? So that's it then. Germany takes the glory; Daimler invented the motorbike........no,no,no. There's a dispute, for eighteen years earlier in 1867 an American, Sylvester Howard Roper invented a two-cylinder steam driven motorcycle. It had a forged-iron and hickory frame and iron shod wooden wheels which must have provided a very uncomfortable ride. I don't know how practical this machine was, but suffice to say, it was powered by coal. The firebox and boiler were suspended on springs from the frame between the wheels, so I suppose it was just the job for commuting work on those cold January mornings. Some people consider this to be the first motorcycle. I'm going to leave you to argue amongst yourselves, but just imagine if the idea had caught on; today we be talking about MPS or miles per sack, and Barnsley would be awash with money. Alas, poor Roper came unstuck. In June of 1896 he took his invention to the Charles River bicycle racetrack in Boston. He had an idea that it would make an ideal pace-making machine for bicycle races. First he completed a few laps while the best bicycle racers tried to keep up with him, then the track was cleared to allow him to show just how potent was his machine. His initial attempt covered a mile in two minutes and 12 seconds for an average speed of about 30 mph. But why stop at that? He knew his bike would perform at an average speed of 40mph as it had done the previous week in unofficial tests. However, as he circled the wooden track and his speed increased, the bike began to wobble causing him to be thrown from the machine. He landing in the sand that surrounded the track, but when worried onlookers reached him, it was clear that he had expired. His death was not a direct result of the accident, but heart failure. The announcement of his death was covered in many newspapers including the Boston Daily Globe. 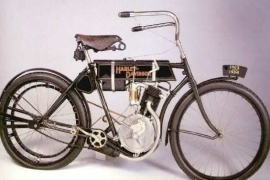 In 1901, a bicycle racer Oscar Hedstrom designed a motorcycle for the Hendee Manufacturing Company of Springfield, Massachusetts, which later became the Indian Motorcycle Company. Whilst Daimler and Roper shifted their attention to cars, a certain William Harley and his friends Arthur and Walter Davidson focused very much on motorcycles and in 1903, three years after the death of Gottlieb Daimler, the Harley-Davidson Motor Company was launched. Their first bike had a well powered engine which could prove itself in races, but the boys had other ideas and launched it as a transport vehicle, the first being sold in Chicago through merchant C.H. Lange. In the early 20th century and throughout BMW manufactured aircraft engines. In 1923 they launched their first motorcycle, the R32 which reached sales of 3000 in just three years. This machine became the foundation for future models. However impractical and cumbersome these early attempts, they were the forerunners of today's machines, and as such we owe a debt of gratitude to men like Roper and Daimler who provided inspiration for inventors that followed. 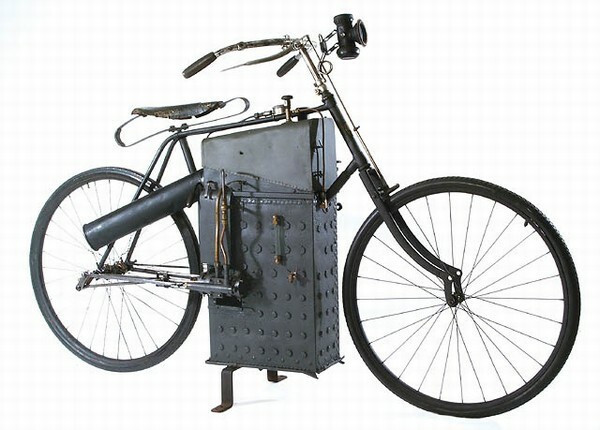 Roper's steam-powered bicycle still exists in the National Museum of the Smithsonian Institute of American History. Alan Liptrot is the founder of Motorbike Tours.co.uk The Company offers guided motorcycle tours in Spain, Portugal and Morocco. We will guide you through the plains and mountains of Southern Europe and North Africa.